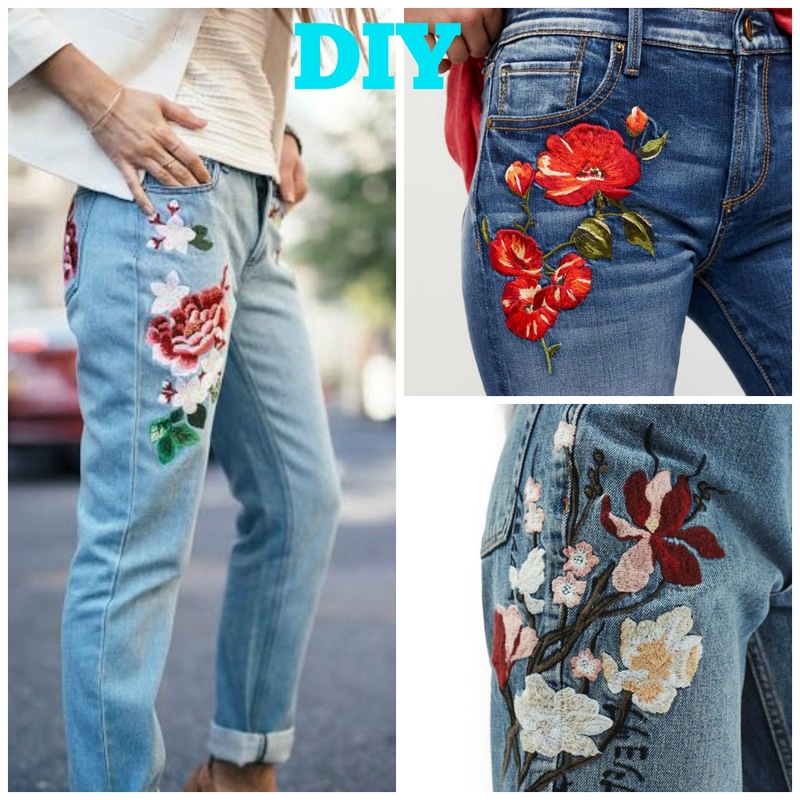 The embroidery and patch trend is here to stay for now and it's easier than ever to create your own with just some basic supplies and a sewing machine. 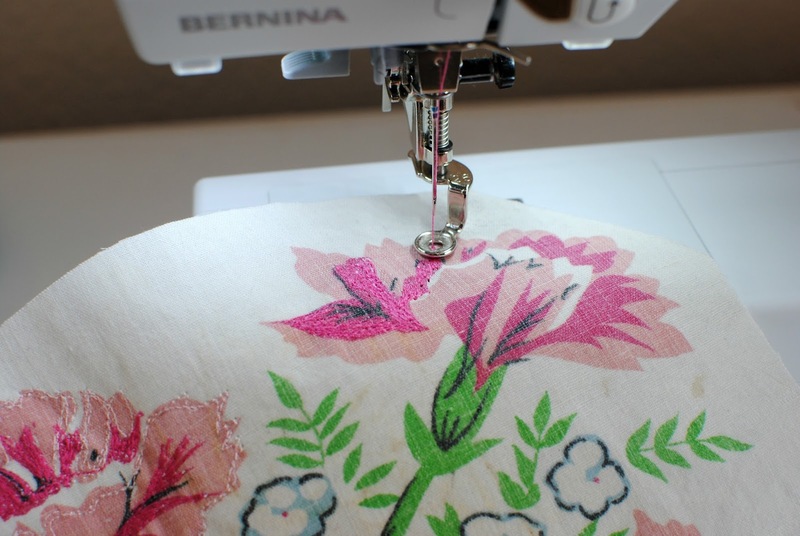 I love the innovative products Sulky offers that make even the most intricate projects manageable. 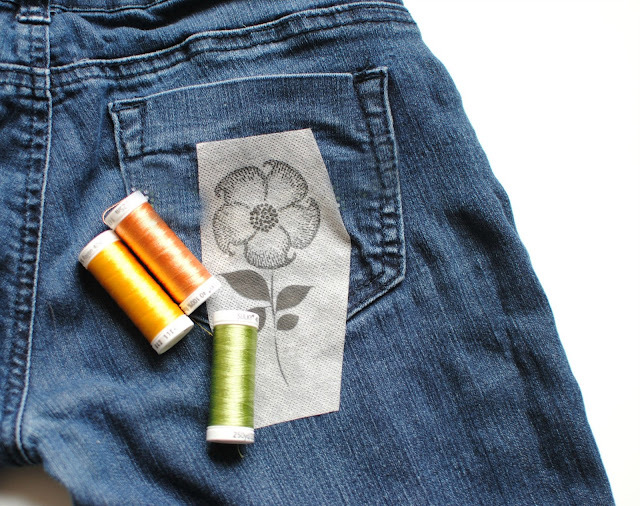 You don't have to own embroidery machines or spend hours hand stitching to get this look. 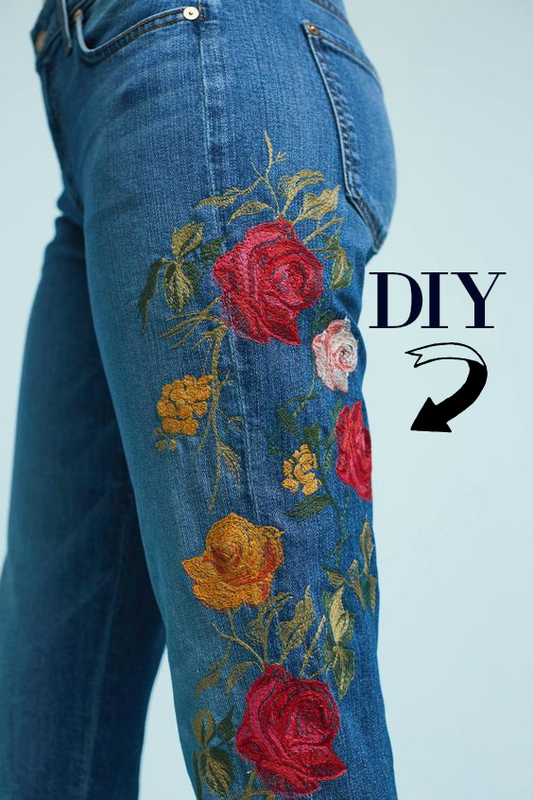 Below I show you how to create your own designed patches to add to denim or anything you'd like and even how to embroider custom designs directly onto your project using a basic sewing machine. 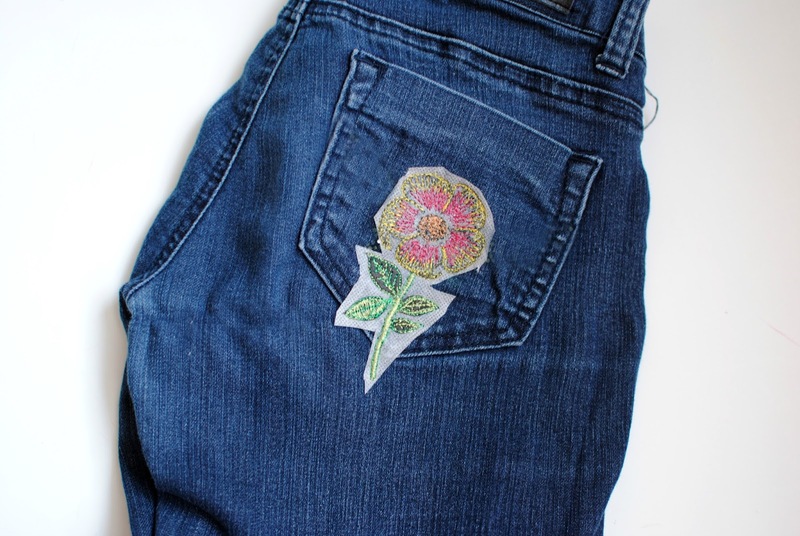 These old jeans had that bejeweled pocket going on and I hated that to begin with but it was made worse by the fact they started falling off. I love the fit though and you know how it can be impossible to find a pant that fits you perfectly. So I decided I'd update the bum with a mix of appliqué and free motion to create this patch look. Check out the full video below to see more of how "thread sketching" is done. 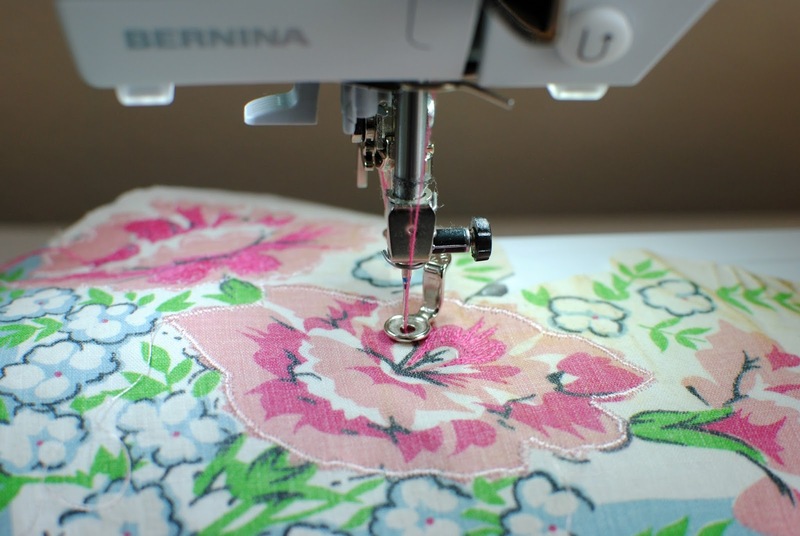 Find a fabric that you'd like to appliqué with. I chose this floral hanky I had in my stash. Because I'll be doing this on the pocket I decided to embroider the fabric first and then sew on the outside so I could still use the pocket. So I chose Sulky's Soft n Sheer as a stabilizer behind the hanky and used their KK 2000 Temporary Spray Adhesive to attach it on. Pick out the threads you'd like to use. I love the new Sulky 40wt rayon threads. They are such a lovely top stitch and come out so vibrant. This is where the free motion begins or another term is thread sketching using your free motion foot (mine is #26 for BERNINA). I drop my feed dogs and simply trace, draw, or fill in with back and forth motions the surface area I'd like to cover. Continue to do this till you fill the area you'd like. I then used the open embroidery foot to do a satin stitch around the pattern to create the patch look and to prevent fraying. Cut the design out around the satin edging and then us an adhesive like Sulky's kk 2000 Temporary Spray Adhesive to keep them on the pocket while you sew them into place. 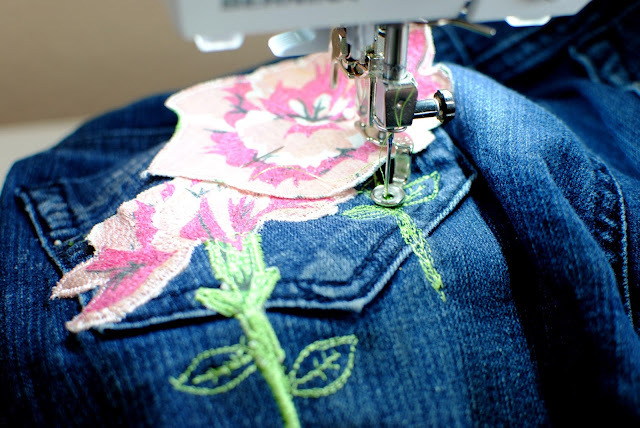 From their I doodled free motion leaves and elongated the stem with satin stitches on the outer side of the pocket to secure the appliqué. Like I said you can just do this straight on the denim but I wanted at least one function pocket. Now onto custom embroidery. 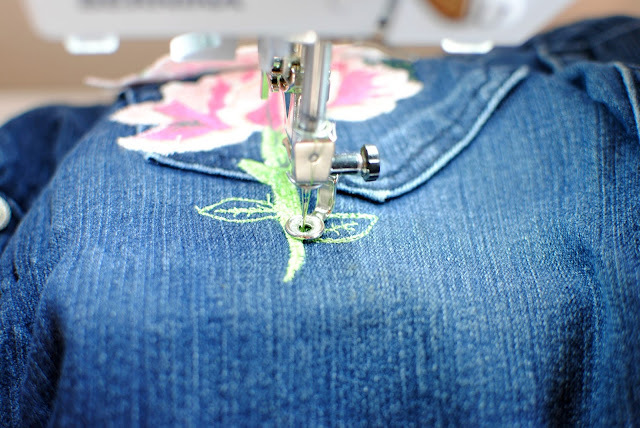 You can even hand stitch embroidery easy with this product. Create or find some designs online and print them out directly onto the Sulky Fabri-Solvy using a basic printer. Cut, peel off and stick the adhesive side down to where you want the design to be. Again using my free motion foot and open embroidery foot I thread sketched and satin stitched right on top of the Fabri- Solvy. This is such an innovative product and makes projects like this simple that would otherwise be difficult or unsuccessful (I've tried). Think of all the fun you can have. I used several of the Rayon 40 wt. Threads again for this one. Once done cut away as much as you can and here is the magic...the rest dissolves in water!!!! And if you have plenty of time make garden of flowers. 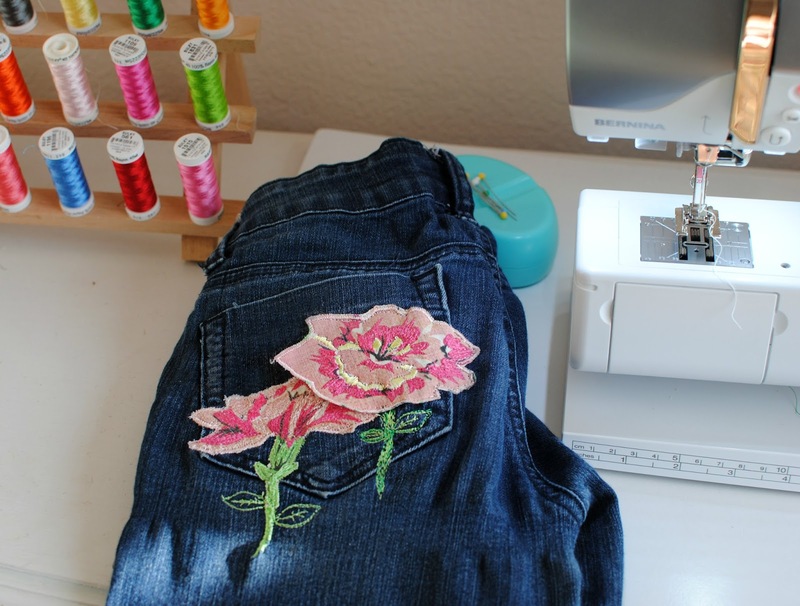 Now you can create your own custom embroidery and patches without a fancy machine or hours by hand. Great post, so inspiring, with great detail on how to do. 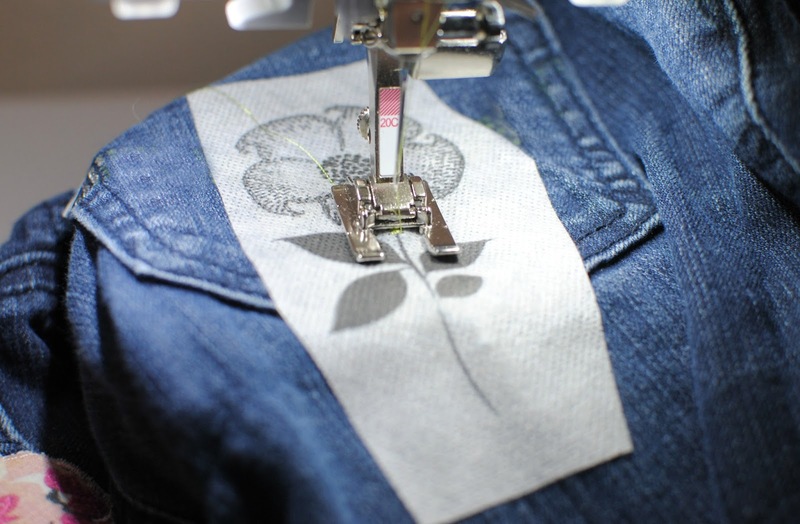 Will be doing some patches on an upcycled denim dress I'm making. Thanks again for sharing. This embroidery looks amazing! It really suits you. I have recently came across your blog and the only thing I can say that I enjoy it! Use canned air or air compressor. 4. Place one drop of oil on the sewing machine race every two to three hours. 5. Clean out the needle bar area ever three to four hours. 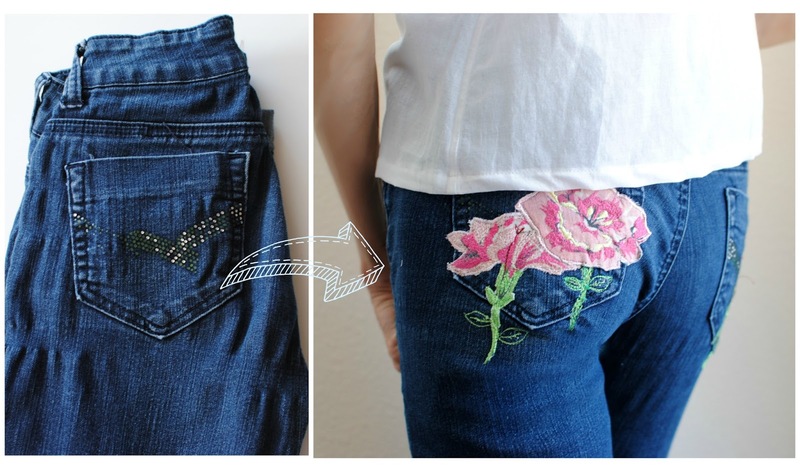 The embroidery works over the jeans are excellent. This embroidery works give extra look to the dress. Really like to appreciate the creative effort. Refer dissertation writing service reviews for more creative ideas. This what you called the embroidery artistic work. 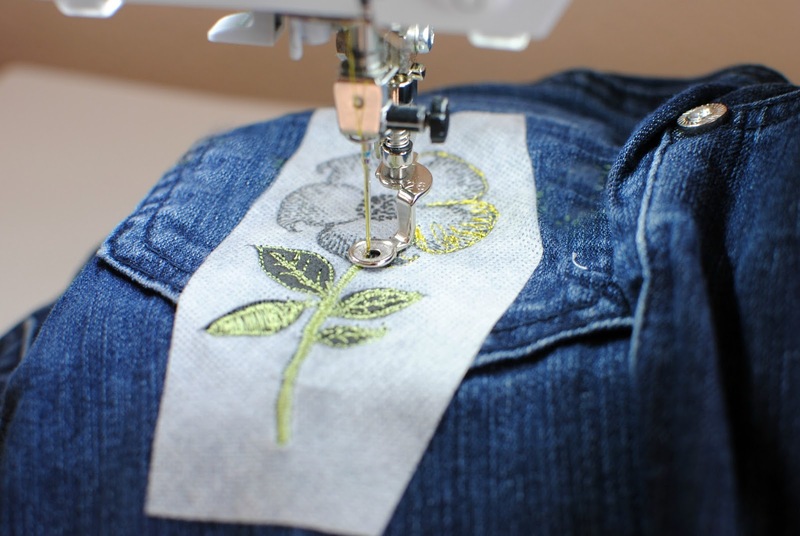 The creativity of embroidery is wonderful and very catchy. Great work! Nice blog.I love your creativity and ideas. that's why i used to follow your post.This diy of embroidery is really great. Hi,Excellent blog. It looks completely able.This is an extraordinarily awesome article for me. YEs, this article was very helpful. 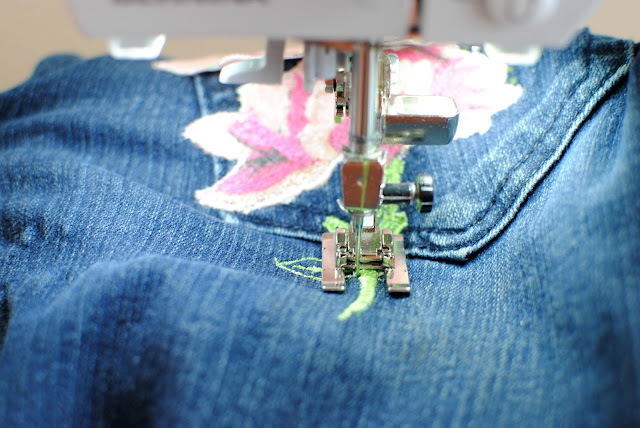 I will get Best Embroidery Machine and try this out. Embroidered patches are very useful for create the various design. You share the Embroidered patch information is very helpful. I like your blog. Thanks for sharing this so interesting post! I really want to be thankful for the way you have put it here. The pattern is beautiful, I like the pants. It so nicely explained. I Just got my embroidery machine and I'll give it a shot. Thankyou for this nice tutorial. 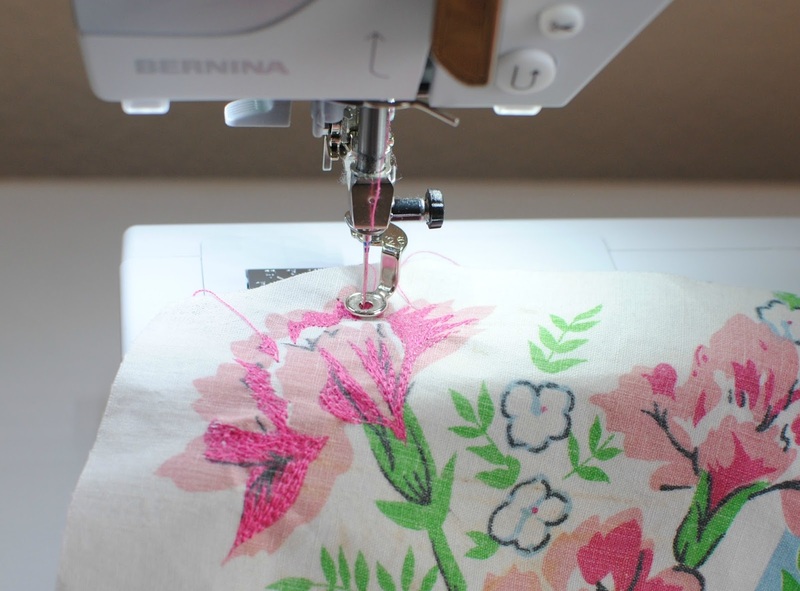 "Press your fabric and cut out four squares approx 8” x 8”." Nice idea and perfect accomplishment of it. Thanks for sharing. The jeans you wear are very beautiful. with very fine embroidery motifs. This is really cool embroidery patch. In fact, I’ve seen something like that after a long time. Such a great idea to make the decoration for jeans by yourself. 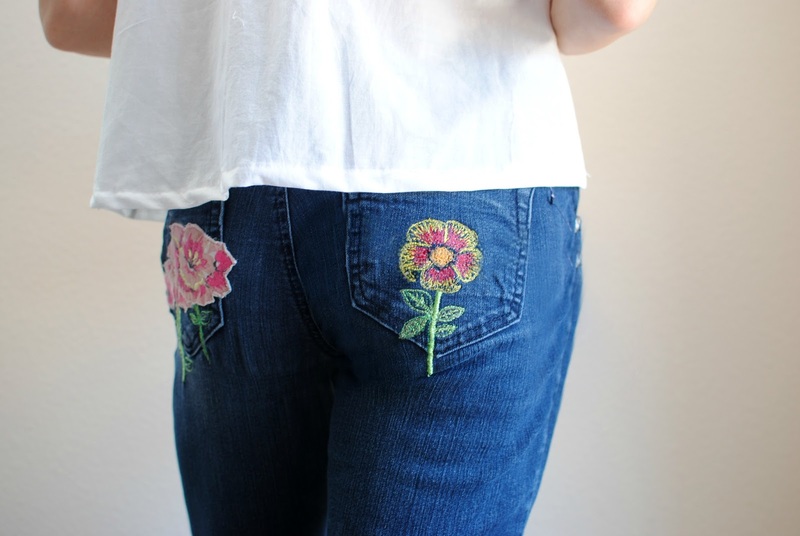 The jeans look better with this flower. I’m writing articles and work on the original-writing.com, here is a great selection of articles. This post is informative and interesting for reading. Also, you can find a lot of helpful information about writing essays and others kinds of papers on this website Masters Essays. what about men who marry young or old?